The unlikely race car. A car that by all rights should be no nearer to a race track than the car park, not racing around it. 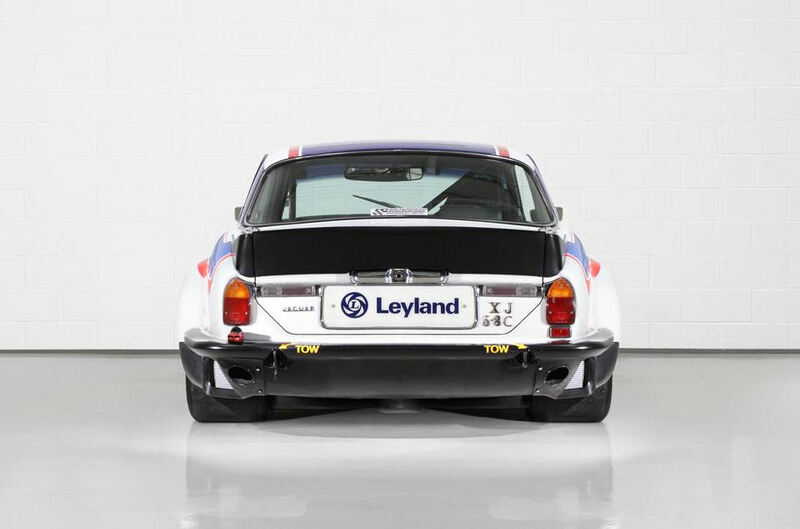 A car that looks like it's bending the laws of physics, which pretty much explains any large saloon converted to race trim and especially the larger Jag saloons. A MKII looks at home bombing round Silverstone or Goodwood, but a MKIX? A MKX?? An XJ12 coupé? 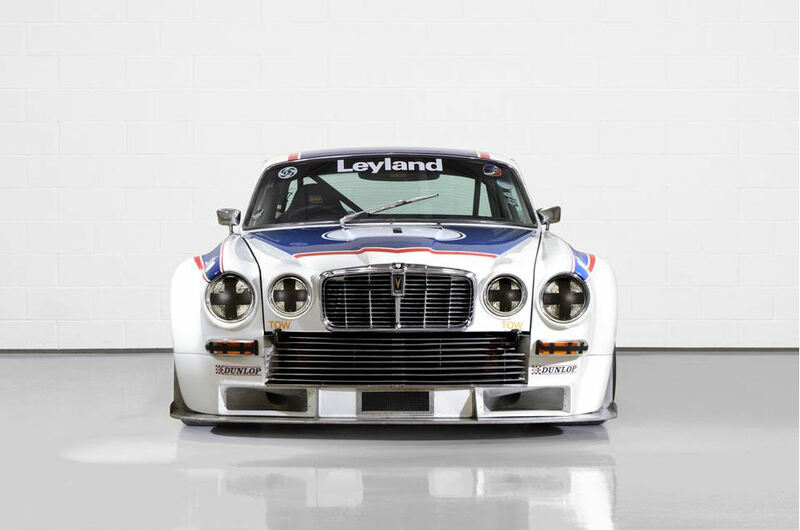 Thats just what happened in the 1970's when British Leyland and Ralph Broad's Broadspeed racing team collaborated to make the big cat into a big race car. 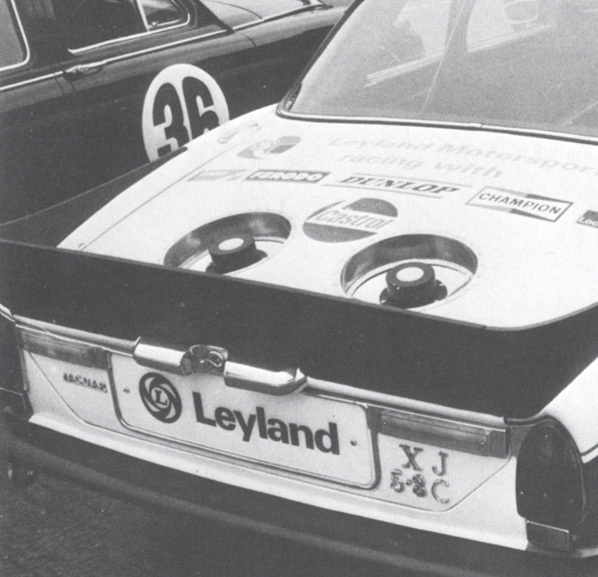 And a race car that still had it's wood dashboard and electric windows, to boot. Unfortunately, the Broadspeed cars were utter failures in terms of race wins but were often extremely fast on the track, setting record qualifying times. The first cars suffered from oil starvation problems, tyre and halfshaft failures. This, combined with a string of mechanical reliability problems, resulted in the cars not being able to finish a race, let alone win one. 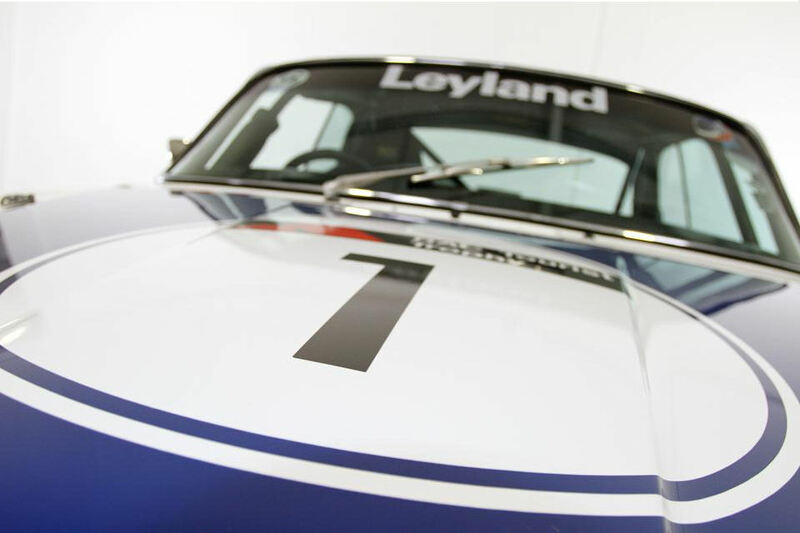 The reliability record, in conjunction with a typical lack of long term BL financial commitment, eventually forced the retirement of the cars and the team after a very short racing career. Later on though, privateers were quite successful once the initial problems of the car were worked out. 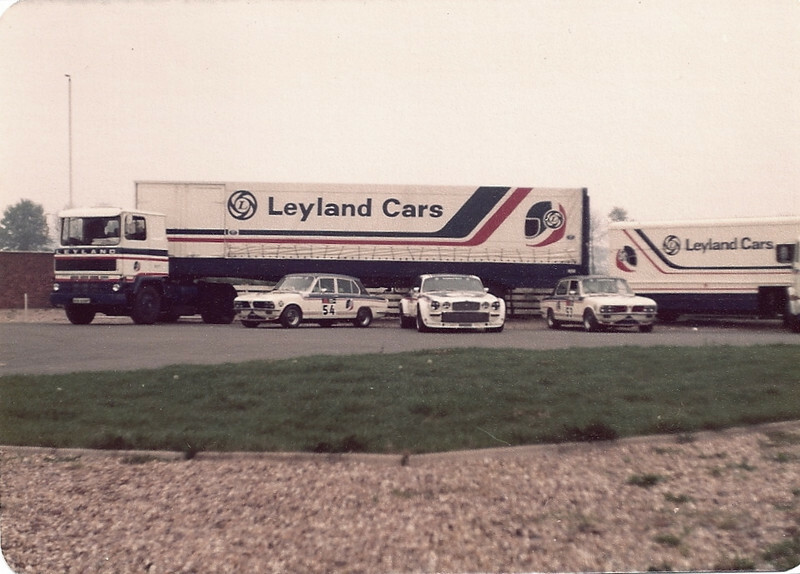 Ralph Broad's Southam, Warwickshire, based racing team had excelled in Touring Car competition since the early 1960s, running Ford Anglias, Mini Coopers and Triumph Dolomites. 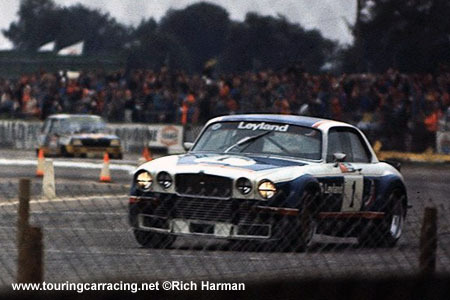 Broad believed in the competition potential of the Jaguar V12 engine and the idea was discussed with Leyland Cars management to prepare a Group 2 Jaguar XJS to confront BMW and Ford in the European Touring Car Championship. 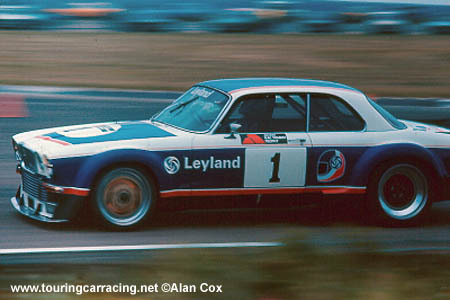 But Leyland wanted the XJ12 Coupé to be used, to help increase sales of the XJ range. 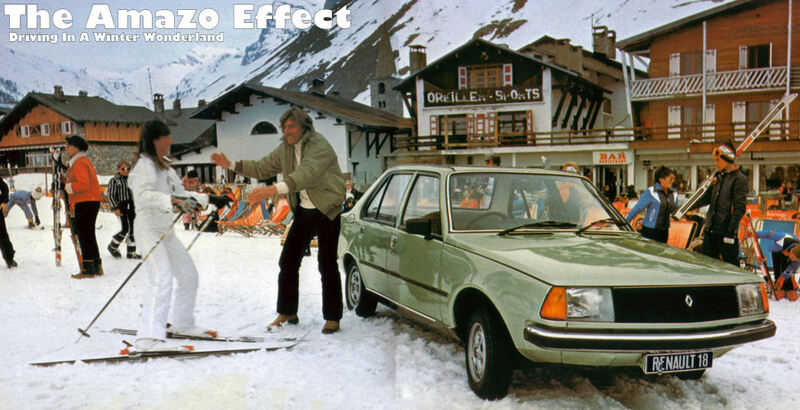 The marketing men won out and the big coupé was chosen. 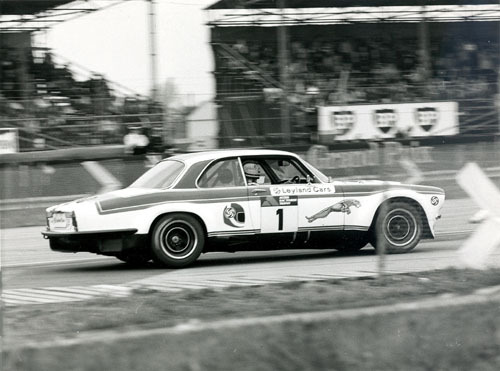 The XJ12 Coupé was larger and heavier than its German rivals, but an heroic development period from October 1975 saw two cars built for the 1976 racing programme. 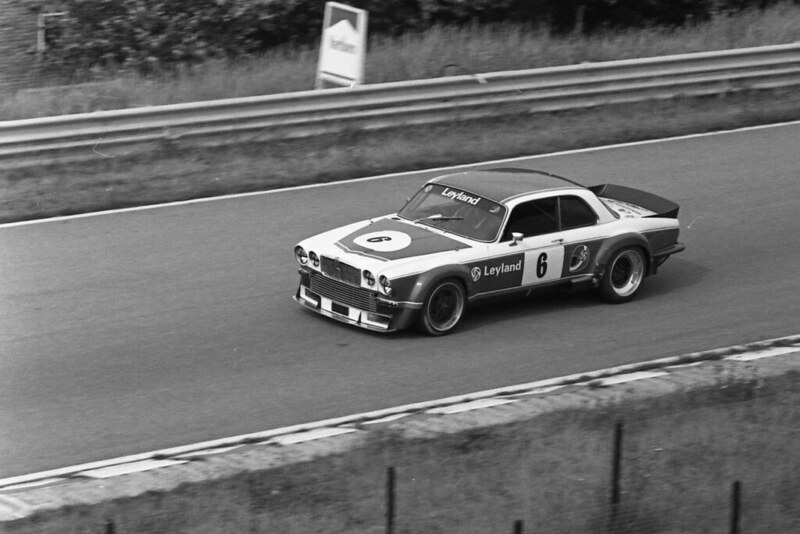 The cars had radically modified bodywork and race-prepared 550 hp versions of the usual V12. The suspension was still basically the XJ design, but with uprated double coil springs and shocks. The coupés were extensively modified on the inside and the exterior shell was lightened by way of acid-dipping. 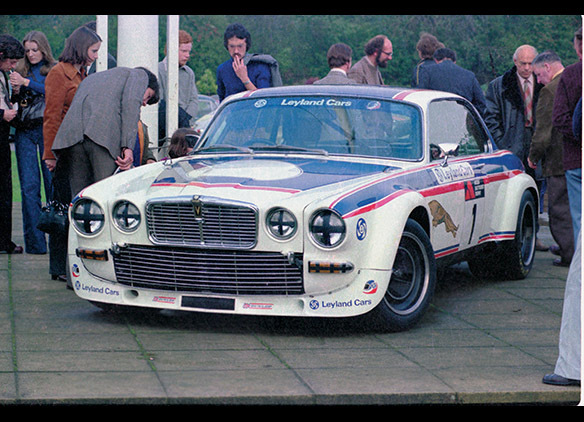 The newly-minted Broadspeed Jaguar team missed the first five rounds of the 1976 Championship series for which their big, beautiful XJC's were intended, and the programme did not make its race debut until September that year, in the RAC Tourist Trophy race at Silverstone. 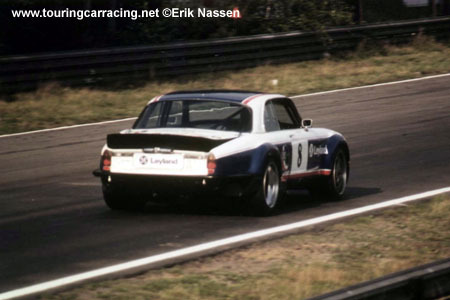 There in qualifying, Derek Bell lapped at 1 min 36.72secs, which was nearly two seconds faster than European Champion-elect Pierre Dieudonné in the fastest BMW 3.0 CSL rival. Bell led the opening stages of the race until tyre wear became a factor and a puncture interrupted the cars race. 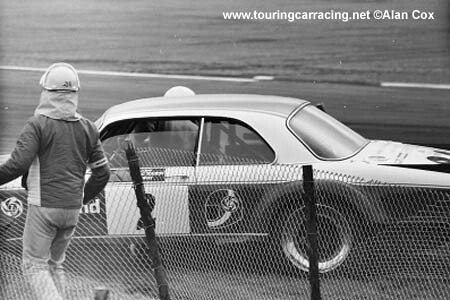 Thereafter the Broadspeed Jaguar XJ12C ran spectacularly until co-driver David Hobbs had a driveshaft break and lost a wheel. 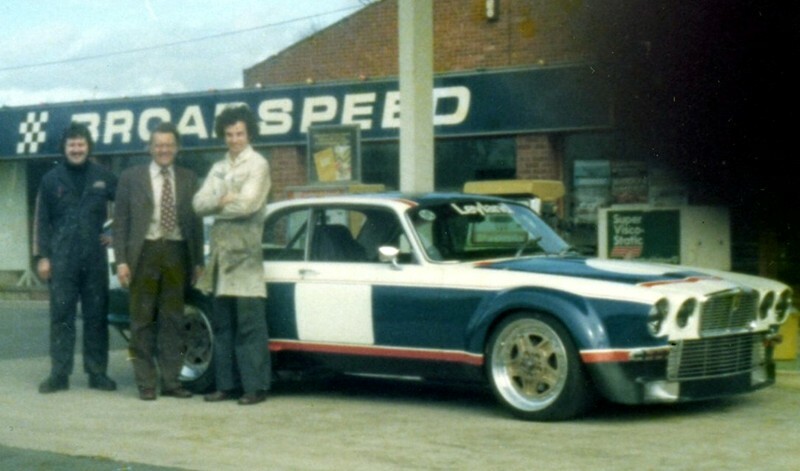 Keith Fell, Ralph Broad and Andy Rouse pose with the then-new 1977 season XJ12C racer, which would battle the BMW CSLs in the 1977 European Touring car Championship. 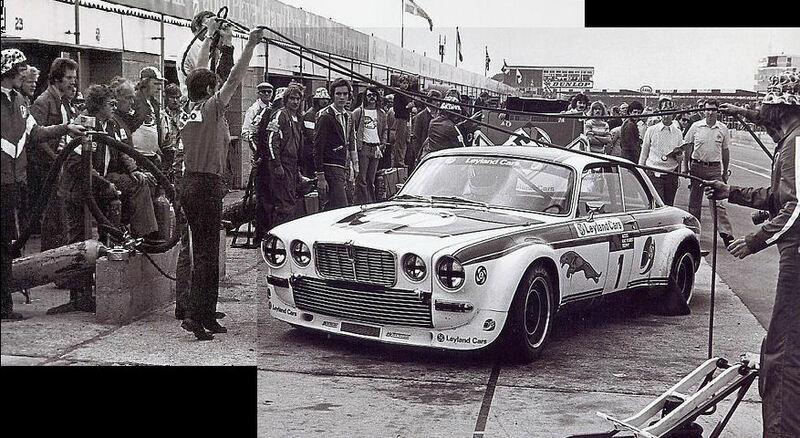 It was considerably developed over the '76 car: note the modified front spoiler, new rear 'ducktail' spoiler, 19 inch wheels, and now even more power under the long bonnet. 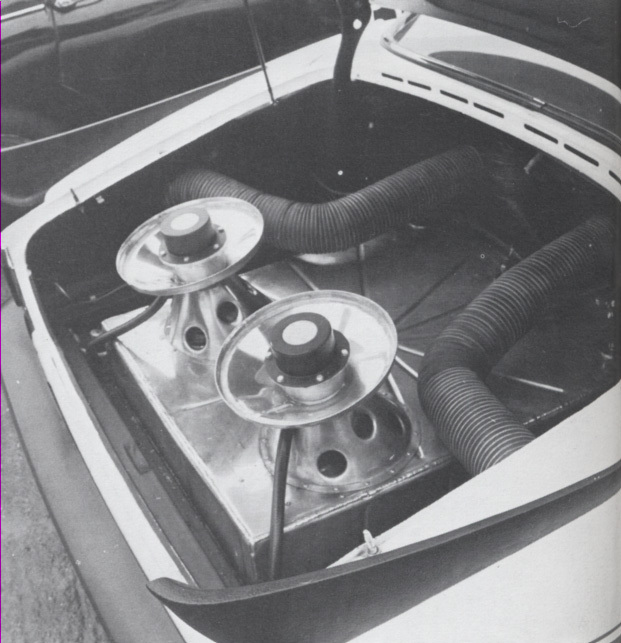 The last engines had dry-sump lubrication to combat oil surge, but it did little to help, as we shall see. 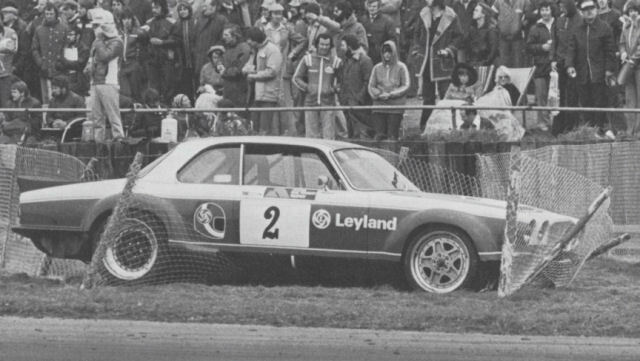 Driver-wise, Bell was joined by Broadspeed engineer and British Touring Car Championship driver Andy Rouse, John Fitzpatrick, whose CV was impressive; BTCC champion in 1966, European GT Champion in 1972 & 74, Porsche Cup Winner 1972 & 1974. Rounding off the line-up was Australian Tim Schenken, experienced F1 racer. At the first round at Monza, Fitzpatrick qualified on pole position, again upstaging the BMW's three-quarters of a second. But there was this problem. Jaguar already lost two engines in practice - with the same oil surge problems because of the cornering forces as had driven other teams mad the previous year. The Alpina team sportingly offered advice on how to combat this, as they had experienced the same problem on their CSLs the previous year. At the start Fitzpatrick took the lead and disappeared into the distance - but after a little over an hour the engine cried enough - the car had spun its crankshaft bearings. Salzburgring saw the Jaguars of Bell/Rouse and Schenken/Fitzpatrick qualify on pole position and 4th fastest. 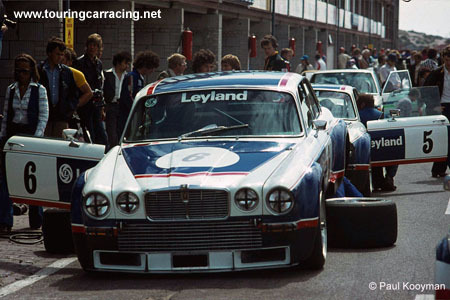 At one point, both XJ12Cs were 1-2, but when the first pit stops were made, the picture was already clear; both cars were already out, with halfshaft failure. 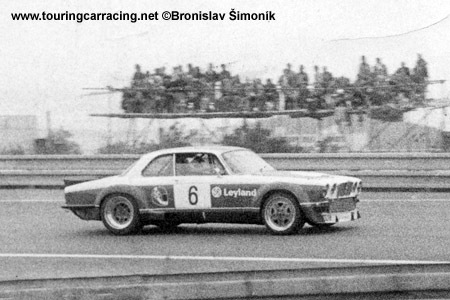 At the 3/12 hour long CSSR Grand Prix Brno, Czechoslovakia, the XJ12Cs locked out the front row of the grid, but they were both in trouble within a quarter of an hour; gearbox failure took out the Bell/Rouse car, and only a fantastic display of sheer dogged determination from the Broadspeed mechanics got the sickly Fitzpatrick/Schenken Jaguar home in a lowly 16th. Mugello saw more heartbreak; neither car started. Broadspeed withdrew the Jaguars before the start of practice, still working out a solution to the crippling driveshaft problem. 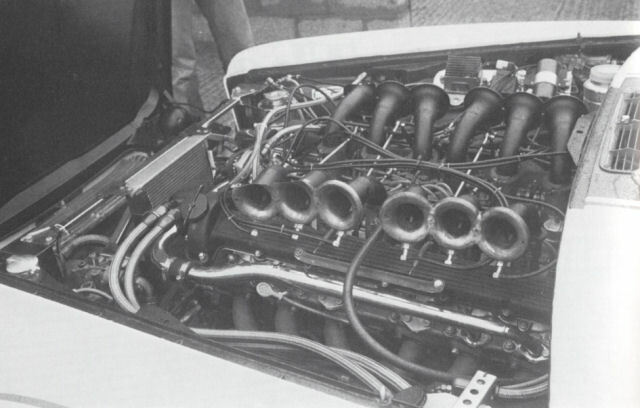 For the Nürburgring round Jaguar, the 1963 winners, brought 12 engines with them, although there should have been a simple solution to their oil surge problem: from July 1st (nine days previous), the dry sump system Broadspeed had developed was finally allowed but inexplicably it had not been homologated, so therefore couldn't be used. 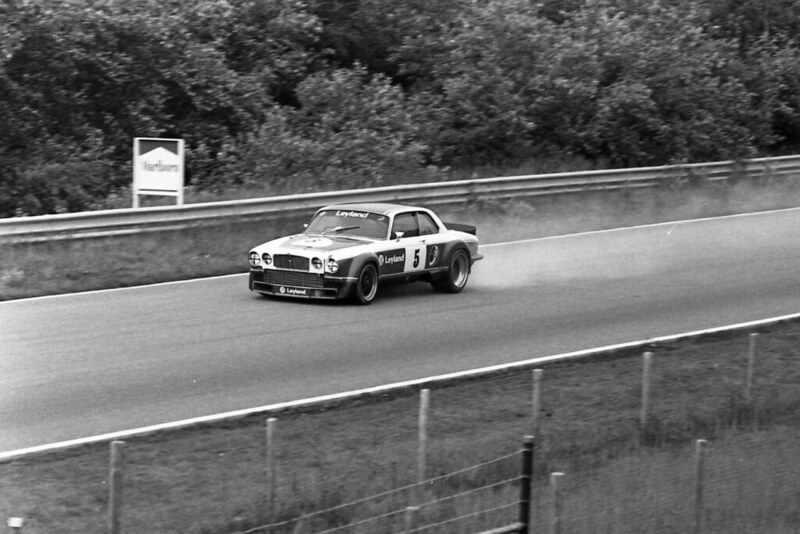 Fitzpatrick then qualified his XJ12C on pole position for the Nurburgring ETCC round, before setting an extraordinary new lap record for the class from a standing start on the opening lap. But, yet again the same old oil pressure problem struck, and he was out on lap one. Bell and Rouse bought consolation by bringing their car to a well deserved second. 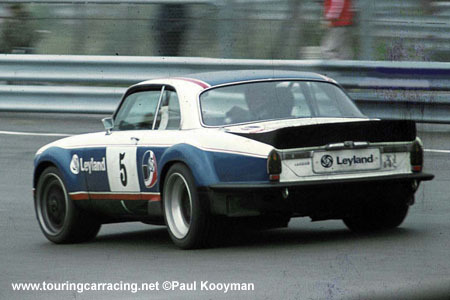 Ultimately, success and the XJ12C were passing ships in the night in the remaining races too; Zandvoort, August 1977 saw a cold and wet practice, in which the Jaguars did not shine: third and fifth on the grid. 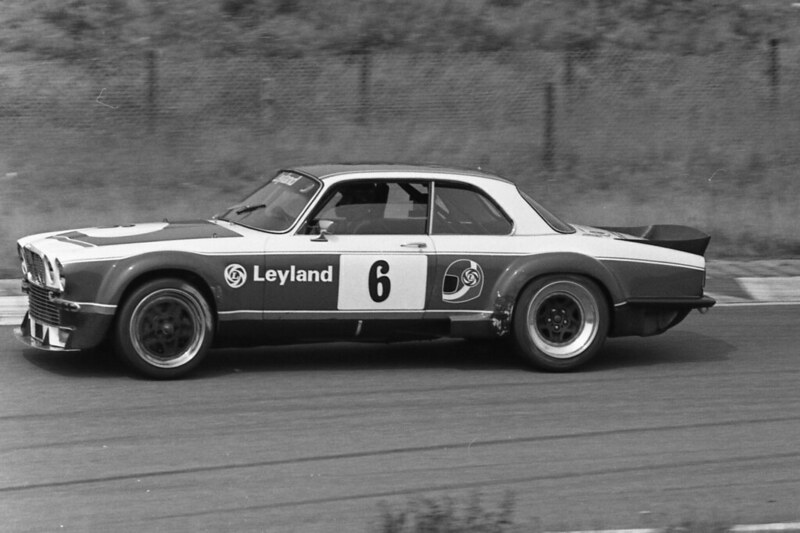 After a spirited scrap between Rouse and Hezemans in the Alpina-BMW CSL, but after ten laps, the Jaguars’ rear tyres overheated and its pace slipped.It eventually retired with a broken differential. The Fitzpatrick/Schenken car was fitted with a dry sump system for the first time - which lasted for 8 minutes, then the pump failed. 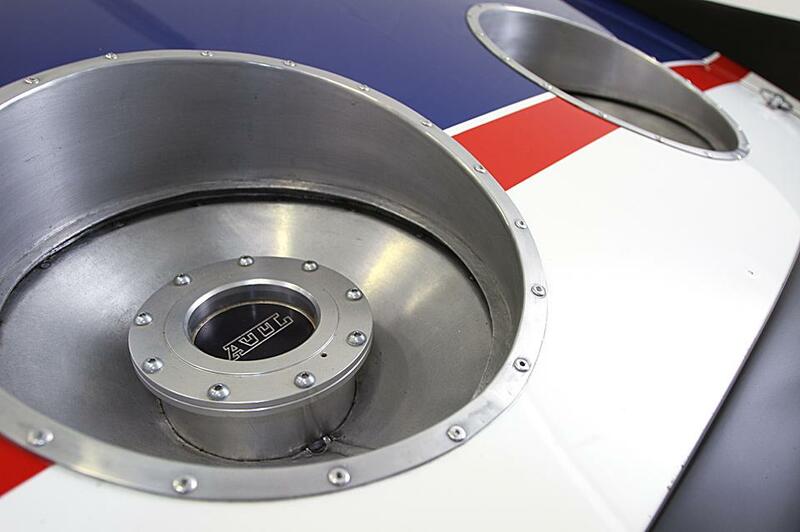 A beefier type was fitted in the pits which was an improvement, it held for 39 minutes. The next pump change took 56 minutes and lasted only 9 minutes, the last one took only 40 minutes to fix - and then the car retired with engine failure. 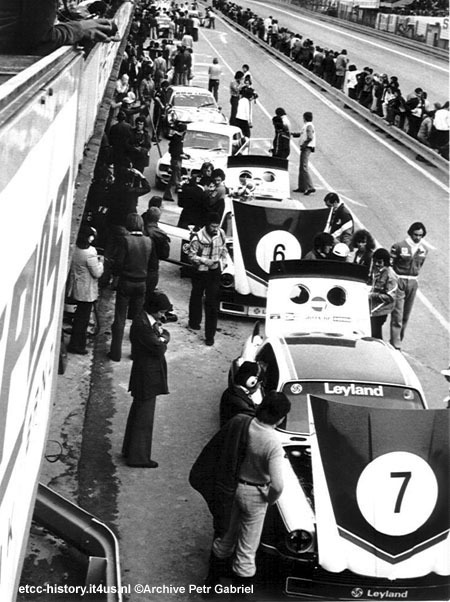 The '77 Tourist Trophy at Silverstone was a decent outing, as both Broadspeed XJ12Cs filled the front row of the starting grid and Schenken led from Rouse at the start. 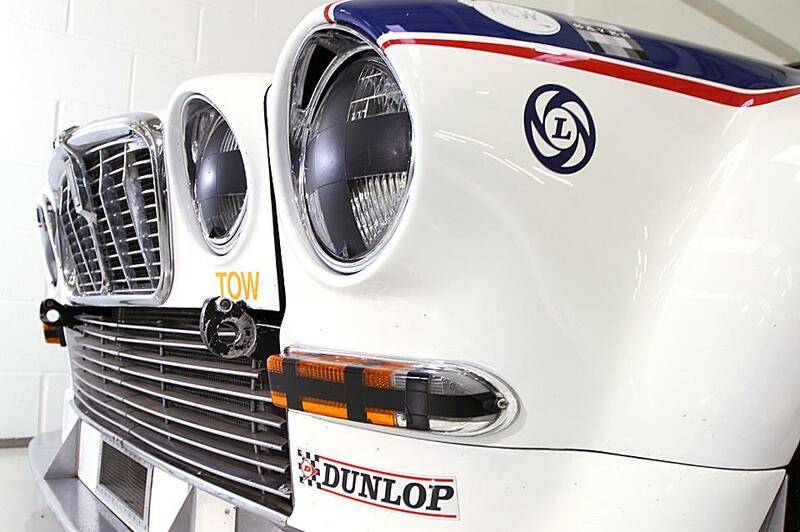 The Jaguars had to pit for fuel twice this race, while their big competitor the Alpina team only had to stop once, not surprising when comparing a big V12 against a 3.5 litre straight six. 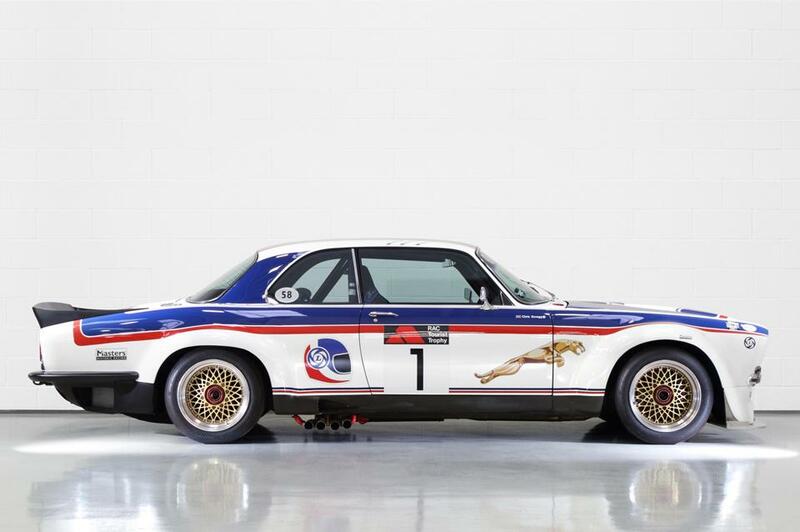 Therefore, the big cats had to create a gap big enough, but the Alpina BMW would have nothing of it; they managed to stay in touch. When Schenken spun in the drizzle, Quester was second and started to attack Rouse. 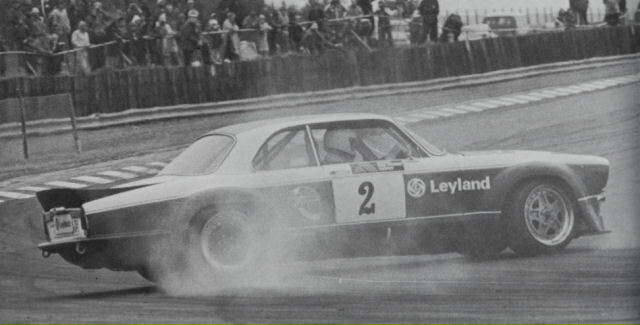 He managed to pass, and after the first Jaguar pit stop Fitzpatrick retired with a broken rear axle. 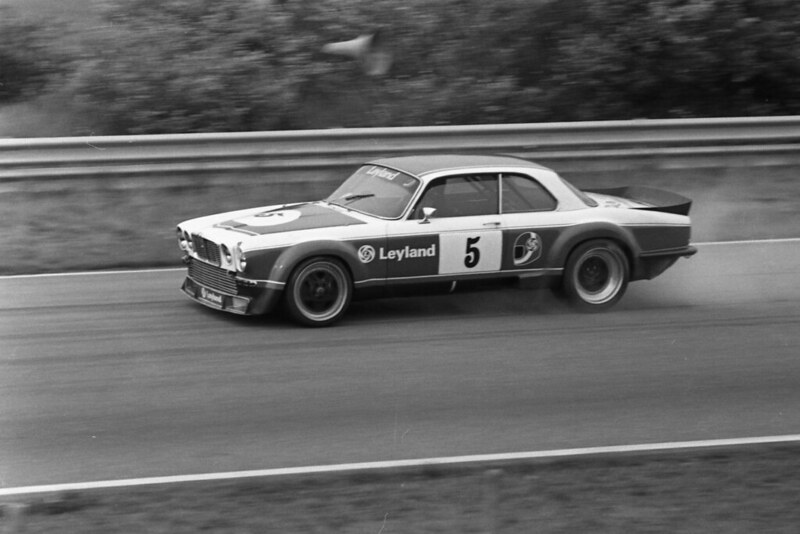 Bell took over from Rouse, Walkinshaw from Quester and Bell took the lead again, its lead growing when the BMW ran into temporary brake trouble. 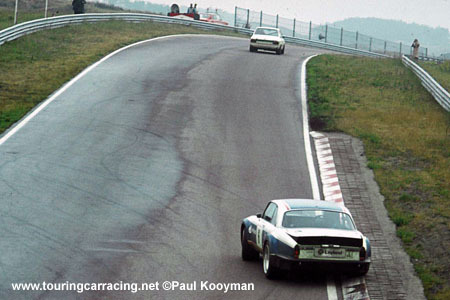 The Jaguar had to stop again for fuel, and Rouse charged off in search for the now leading BMW. He closed the gap to 10 seconds, before he spun into retirement on oil only 9 laps from the end; he was classified as finishing fourth. 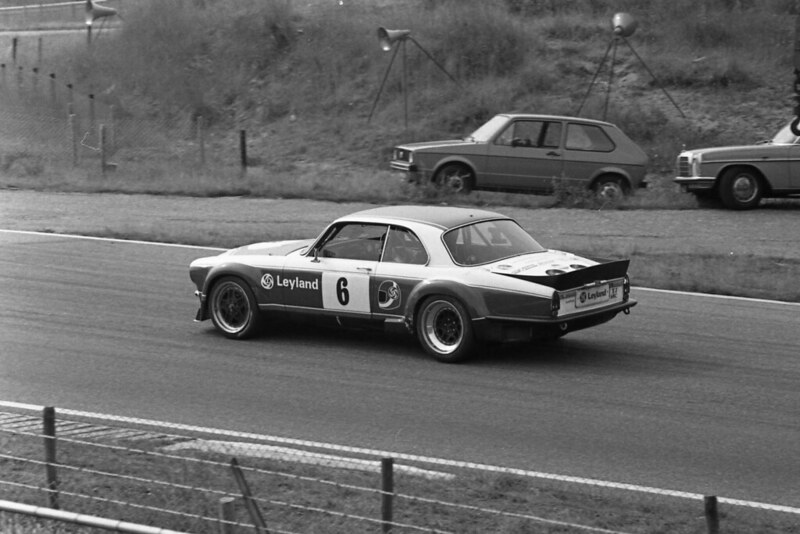 Although the ETCC season hadn't ended, Zolder marked the last appearance of the Broadspeed-prepared Jaguars.After running second and fourth in the early stages, the two Jaguars were both back in the paddock after an hour and a half. Fitzpatrick/Schenken, who had been in the lead, then dropped to second, went out with a dropped valve. Rouse and Bell retired with gearbox woes. 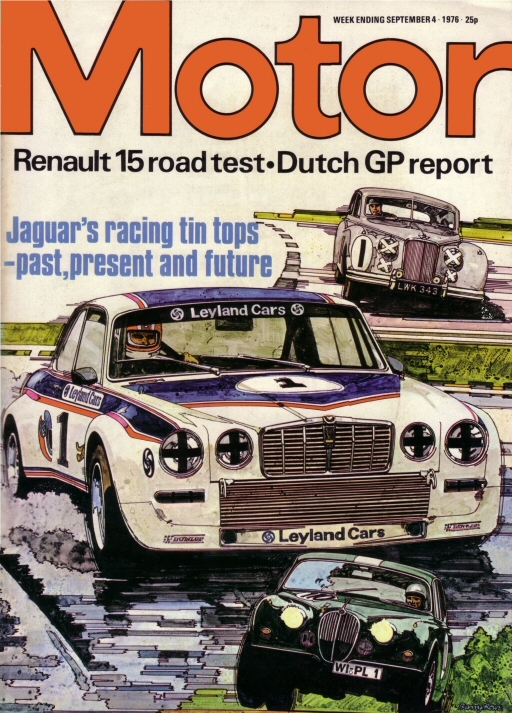 In hindsight, it was unfortunate that British Leyland denied the team a third season's competition; with the XJ12Cs fully developed and equipped with the dry-sump engine, it seemed very likely that the Coupés could have been race winners, and there is no doubt that during 1976-77 the car was much quicker than its BMW CSL competition, but the CSL by then was a race-proven commodity, with reliability the Jaguar could only dream of. 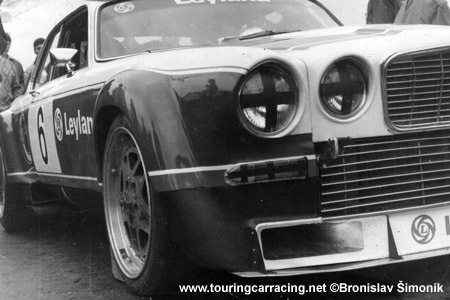 The plug was pulled on the operation, and the Broadspeed XJ12C roared no more, at least at an official level; the cars were sold to privateers and collectors and saw success in more colloquial championships, with ironically most of the reliability problems ironed out. 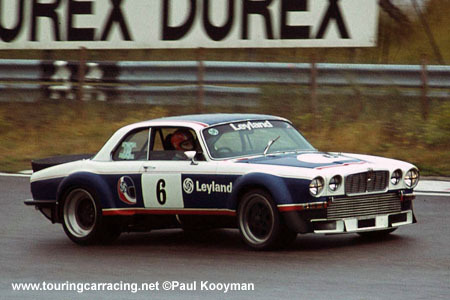 The car here is no 2 of four built by Broadspeed in 1976-77, chassis number BELJC002. Upon Broadspeed's closure it was rebuilt by Bob Kerr and features uprated 1977-specification suspension. 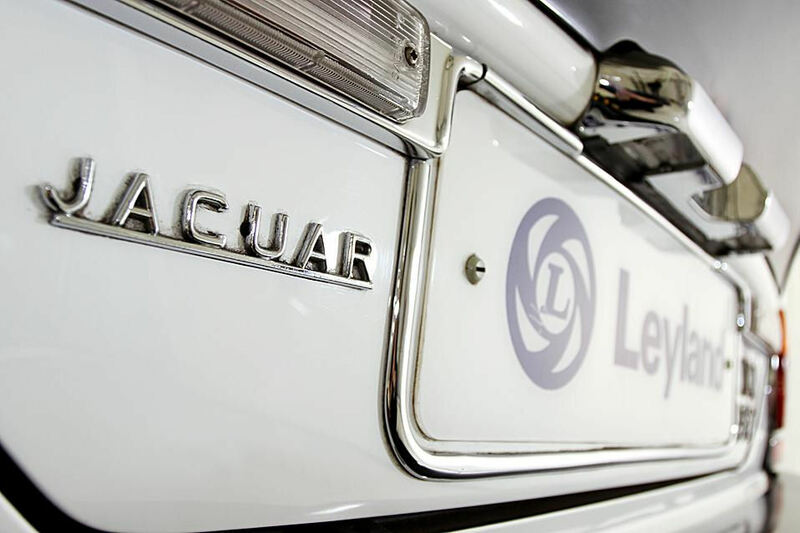 It formed part of Jaguar enthusiast Allen Lloyds private collection before being acquired by its current owner. 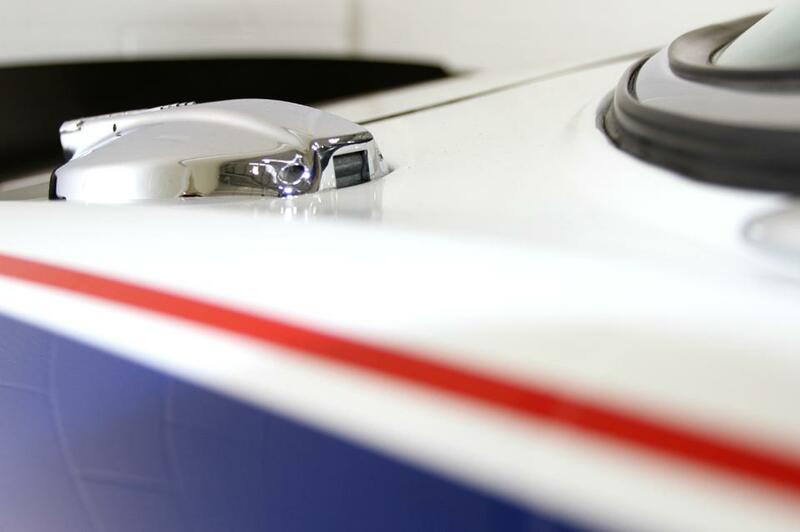 It's run no fewer than three times in the Goodwood Festival Of Speed and could also race in historic touring cars. 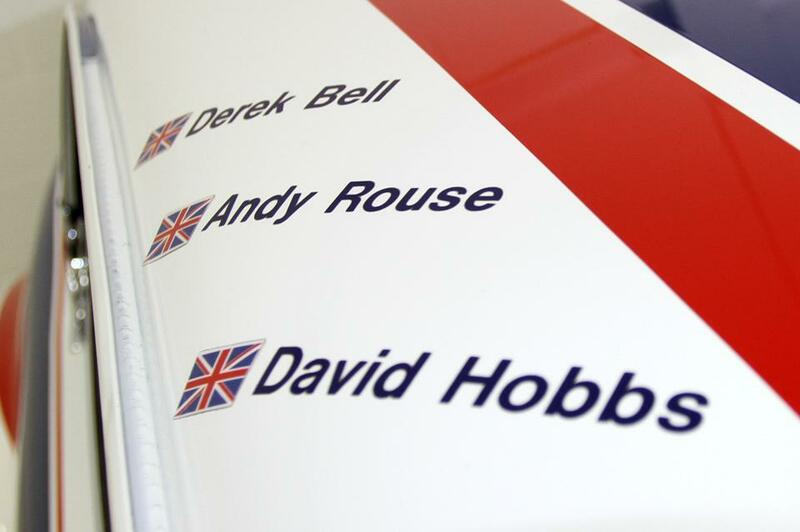 The roof is signed by both Derek Bell and Andy Rouse. 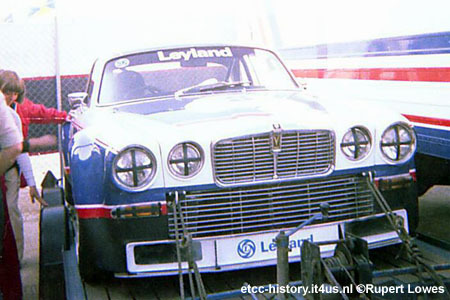 The Broadspeed XJ12C was a sadly infuriating what-if;, in just two seasons they at times showed fantastic potential, but sadly never realised it by winning a race. One more season of development may have changed all that. But we shall never know. With grateful thanks to all concerned for the raw info and pictures. Love that car! Thanks for sharing! Street Life - Capri. No Sun.